Here is a list of high voltage power supplies with schematics and construction details, going from simple to complex. 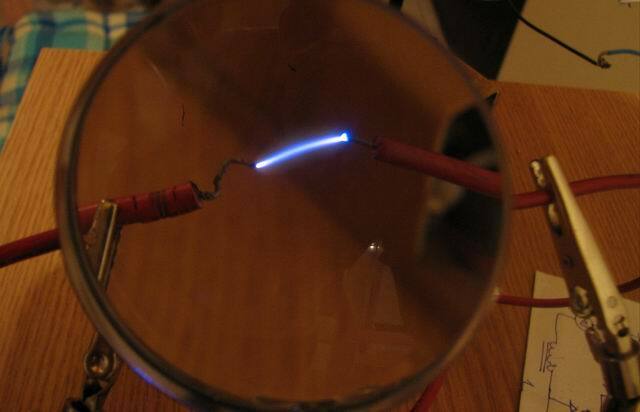 Be careful if building any of these, high voltage can be dangerous! Probably the very first high voltage device built by any enthusiast. It uses a power transistor (2n3055) and two coils: a primary and a feedback on a flyback ferrite core. 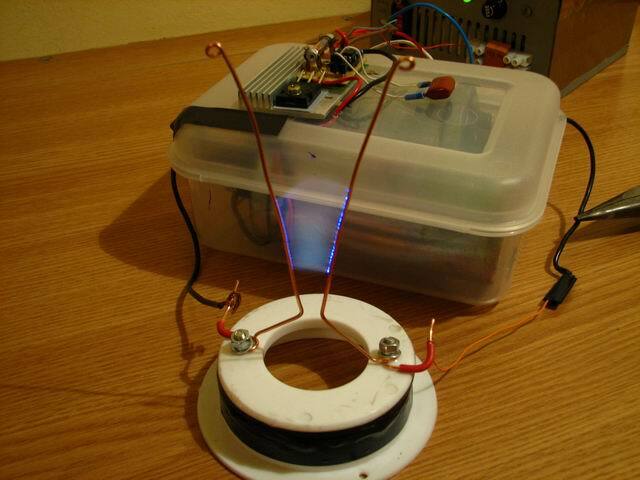 You can use 2 x 2n3055 transistors in a better circuit that provides more power . However this too is prone to failure due to the transistor limitations. A large heatsink is required as well. If the flyback doesn’t provide the voltage you require, a solution is to build a voltage multiplier. You can hook it to any flyback secondaries that doesn’t have built-in rectification (diodes or multipliers). This circuit uses a 555 timer IC to pulse a power transistor with square wave at a frequency that is set by the capacitor and the potentiometers. 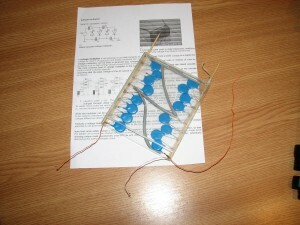 It is a very efficient circuit, assuming the frequency is correctly adjusted. 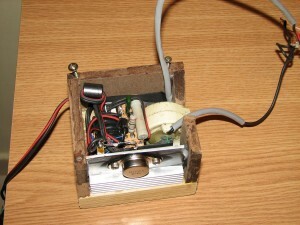 Adjusting the frequency with the pot, I got some tick white arcs, similar to those produced by a flyback with a ZVS driver. A good indication of the power running in the system. 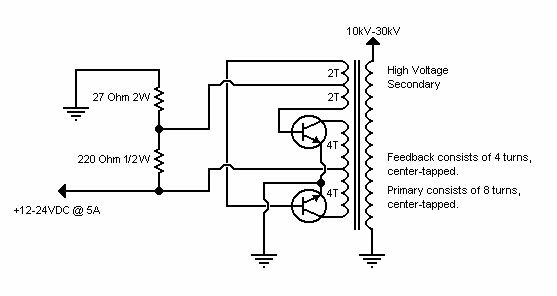 A powerful driver with excellent results (no transistor heating, a lot of power pushed), is the ZVS (push/pull) driver, that was described in this article. The ultimate in high voltage records, this device was discussed here and here. Taking advantage of the way the secondary is constructed, several issues are solved by construction: the secondary insulation is trivial. More on the HFSSTC here. That’s great Mhavskie, post some pics if you’d like. First of all congratulation for your site! I put two flybacks in series. I followed your schematic but the result with two flybacks was worse than a single one. 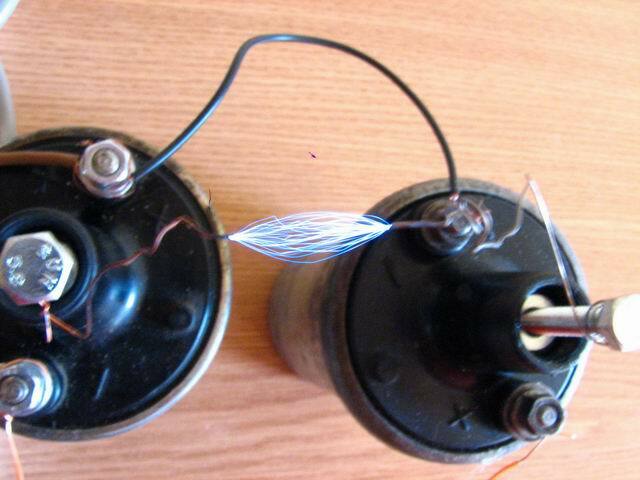 did you wired them correctly? 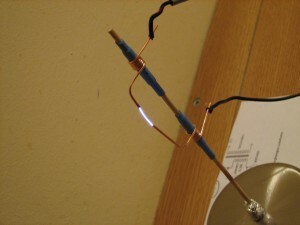 the hot wire from the first must be connected to the opposite wire on the second. if this doesn’t work, try using two identical flybacks, or wire your own secondaries. Eu am reusit sa scot peste 100kv din doua transformatoare de Chevy la aproximativ 350W. Am folosit un 555 si mosfet sau igbt de putere. Problema e ca nu reusesc sa shuntez bine bobinele si se distrug tranzistoarele. Am incercat si neon da s-a topit in 5 secunde…Am un Fusor si pentru asta incerc sa fac tensiune cat mai mare…numai bine! Hm, un Fusor, ar fi frumos de ai pune niste poze. Mi-ar placea sa-l vad. 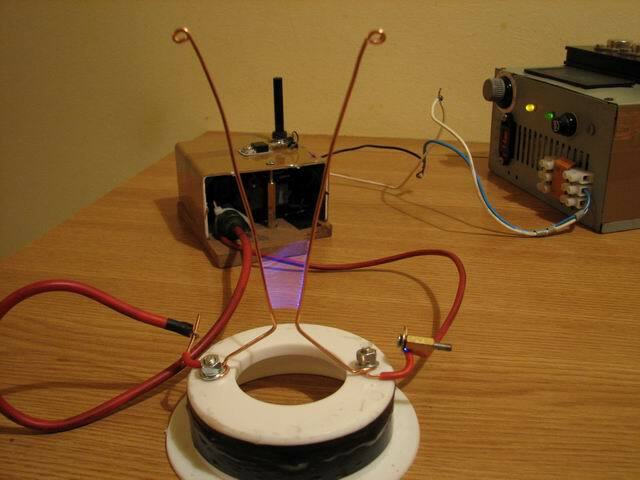 La 100kv cred ca apar multe pericole datorita radiatiilor. Hm, cred ca ai o sursa de neutroni pe cinste. Folosesc bobine de inductie (sunt detapt transformatoare nu autotrafo) de la Chevrolet Cavalier(sunt in philly, sua) legate in paralel la intrare si in serie la iesire. Folosesc mnosfeturi sau igbt-uri de putere ca switch , dar tot mi se prajesc pentru ca e prea mare tensiune autoindusa din primar. Trebuie sa fac un snubber mai bun…Fusorul (am sa fac niste poze…odata) n-a functionat niciodata cu deuteriu sau altceva decat cu aer,…e bun numai de bronzat la fata ca in felul acesta (grila externa, grila interna) n-o sa scoata energie extra niciodata! 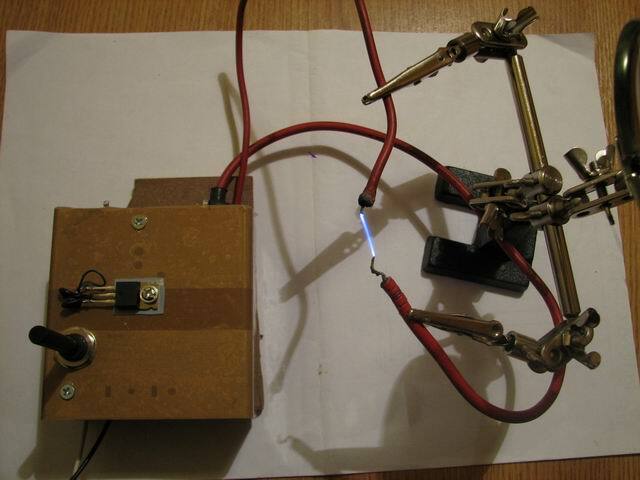 Chris was saying that he uses two Chevrolet Cavalier induction coils to generate 100KV for his Fusor, but he’s experiencing difficulties protecting the driver transistor from spikebacks (in a 555-driven switcher circuit). His neon snubber has melted in 5 seconds. I was then just asking more details and photos about his Fusor, we all want to see it, right? ..hmmm.. RAd, how many turns thus in the ferrite core have in 555 timer base..??..^_^.. sorry for my english..
Hi zildjhan, try arround 15 – 30 turns. Engleza mea nu e atat de buna pe cat i-mi doresc(dar lucrez la asta). Un 555,fie el NE/SE/SA nu poate comanda direct un MOSFET,de aceea folosesc 7555(555 in varianta mos). Problema pe care o intampin consta in faptul ca nu reusesc sa obtin mai mult de 2KV…in sarcina.O fi bobina de inductie defecta?sau ce? Poate e necesar un etaj push-pull pt extragerea sarcinii din grila mosfetului(am intalnit efectul de stocare la tiristoare). This messages is in romanian,used translate.google please. 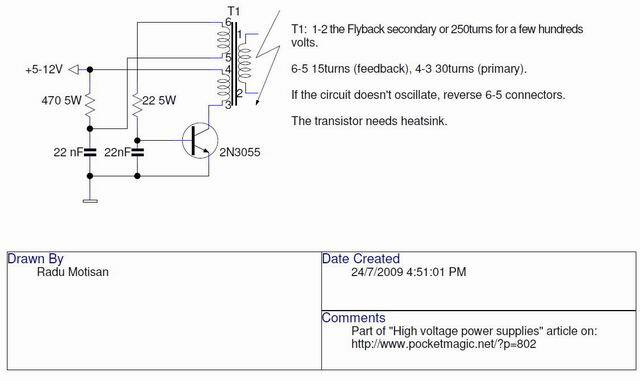 tyc, use a totem pole setup (generic PNP+NPN) before the mosfet, just to be on the safe side. I’m not familiar with the 7555, but regular 555 will NOT work with a mosfet. So just add the totem pole and see if this helps. You say you’re using an induction coil? 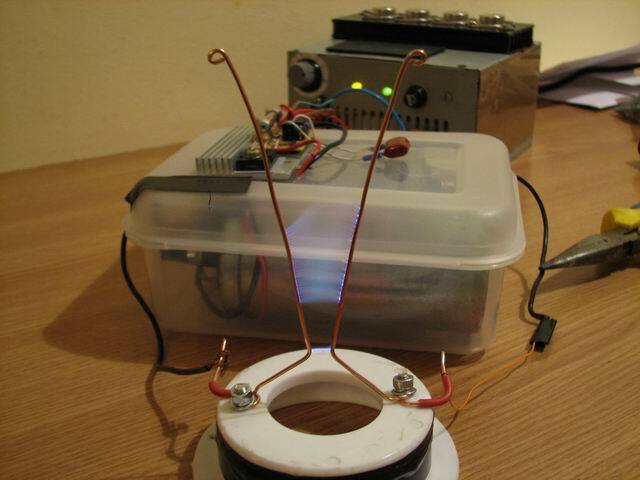 Please note that an induction coil works at much Lower frequencies than a Flyback transformer. 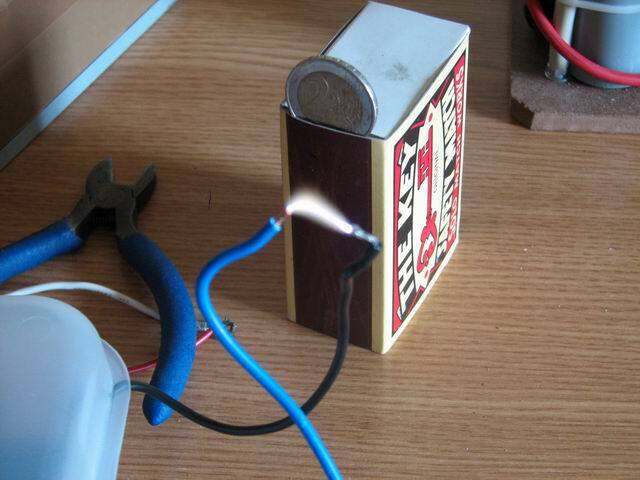 Instead of the 100nF capacitor, try as high as 1uF. 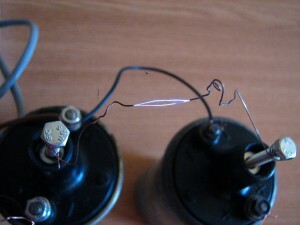 When the coil works best, you should hear an annoying bass-like sound, like a strong vibration coming out of the coil, and NOT that high-frequency sound like in the case of ferrite core transformers. Last issue, indeed the coil might be broken, you should be able to measure the resistance of the secondary, if it’s >4KO the coil should be ok, but this is not the best test. However I never tried that setup yet. Good luck! Intradevar,555 nu poate dar 7555 poate…cele mai bune rezultate le-am obtinut cu LMC555D.Pt E555 e necesar etajul push-pull. Tensiunea in gol e de 7KV,iar pe sarcina cu impedanta de 500ohmi pica la 2KV.Tensiunea in primar e limitata cu transil bidirectional ,la 300V. Oscilatoarele autoblocante sant exclus deoarece se doreste reglarea curentului,alimentarea e la 12V cc. Finalul(IRF840) nu se incalzeste,fara radiator. Frecventa de repetitie e de 1Hz cu factor de umplere de 10%.Consider ca in 100ms se incarca bobina …bobina a fost probata pe un motor,e in carcasa de Al(nedeformata). 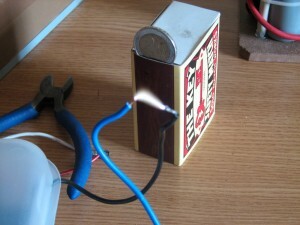 Pingback: PocketMagic » High Voltage Multiplier (Half Wave Villard Cascade) 28 STAGES! with 3 to 6KV output from flyback T. Is this ZVS driver suitable for this? can you tell me the name of the programm that you use to draw your schematic? @Sinise, this driver is a push and pull type, I don’t see how you could adjust the frequency. You could use a variable turns primary or a variable capacitor tank, but that might not give you such a big interval as 35-50KHz. a range of 35 to 50Khz and to drive with low voltage 12v up and down. 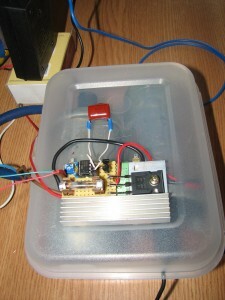 I don’t need very high voltage just around 3000V to 6000V low power. But you saying a push/pull driver like ZVS is not suitable for this ? If so , which one would you sagest ? I was saying that I’m not sure what frequency range you will get (you said you need 35-50KHz). Besides that, you can use the ZVS, actually it would be a good idea to use it, to have a robust driver that doesn’t heat much, so it can run for longer periods. In scema nu ai pus si diodele iar in imagine se vad doua….merge si fara diode? daca nu atunci poti sa-mi spui unde in schema trebuie sa le pun? sau daca ai avea o schema cu tot cu diode ar fi mai bine. Multumesc! salut Florin, merge si fara diode. Florin,o sch pt gard electric(electric fence)? Poti folosi sch de mai sus(cea cu 555)…o configurezi sa genereze pulsuri la 1,5 secunde; energia in gard e proportionala cu lungimea acestuia. Ai fi dispus sa ma ajuti si pe mine, as dori sa inteleg exact matematic ce se intampla, imi este foarte usor sa fac o replica la ce proiecte faci si multumesc in numele tututror pentru ca ne impartasesti experimentele tale (si noi putem profita de ele 🙂 ) dar eu am o mica problema, la faza cu transformatoare eu is cam bata si daca mi-ai ptea explica putin te rog sau mi-ai putea sugera cateva link-uri pentru ca sa inteleg si eu mai bine de ce atatea spire si alte detalii de acest gen.
Daca pot explic cu placere. Ce anume te intereseaza? I was looking at a stun gun website. 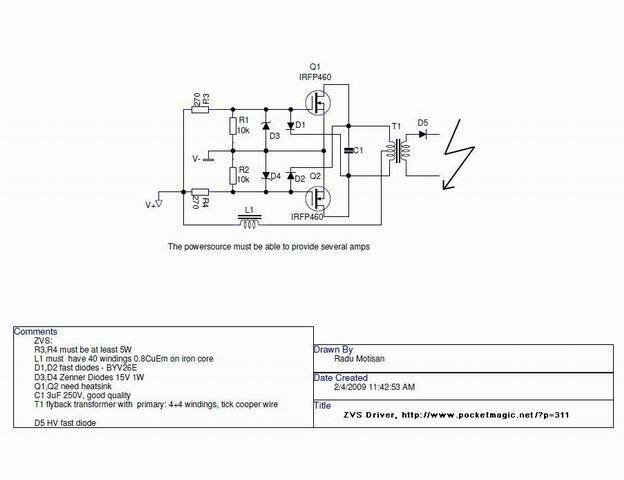 Can I use one of these driver circuits on their stungun circuit designs and will it be alright with an 60.000 volt XGenR4 Pulse Trigger Transformer. 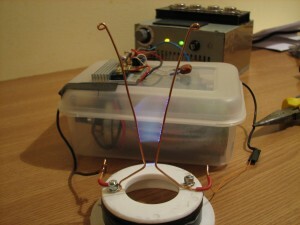 Dear Radu Motison, I want to build a ozone generator & for that I need to build a reliable HV generator of around 10KV. Can you please give me some schematics suitable for this purpose ? Is 10KV is ok for this purpose. Please help. @Goswami, use number 5. 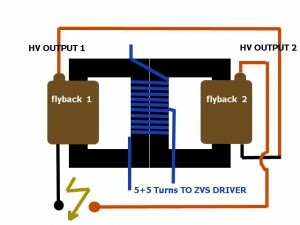 ZVS driver presented on this page. I found your website after seeing one of your videos on Youtube. I would like to ask if you’ve got a circuit that can drive those HV neon tubes (as used on shop signs). I’ve got a few tubes in the garage and wanted to try them. What would I need, and can you give me a link to something suitable. Dear Abdullah , drop me a mail with a few photos showing your neon tubes, so I can better understand the type you have. Hi, how would I be able to vary the frequency without changing the amount of turns on the primary? 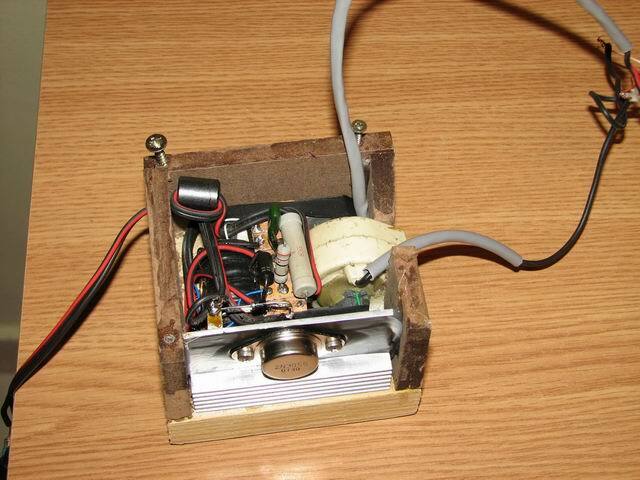 brother radu, can you tell me, at first picture (Simple flyback driver 10-15kV), a capasitor, how much voltage and power? 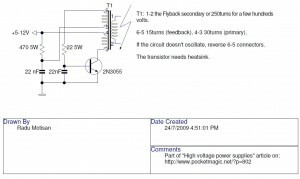 please teach me about voltage and power a component, how do I know if the scheme is not listed? @alfiyan feel free to use any value , such as 24V, 50V, etc. 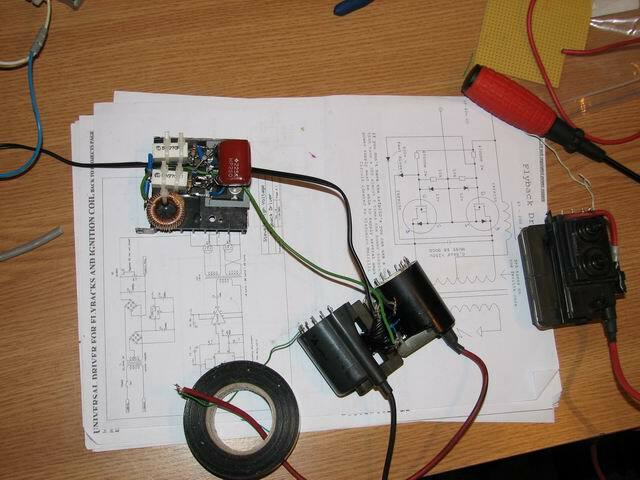 salut radu de unde ai schema cu un tranzistor Simple flyback driver 10-15kV, mie mi se pare ca e un circuit basculant daca nu gresesc? merge ca ca nou si scoate dupa mine 30kv dar se incinge npn-ul,am folost un flyback de tv alb negru dar vreau sa ii pun un multiplicator de vostaj din diode si capacitori oare asi reusi sa scot mai mult cu Villard cascada? I need a HV generator DC preferably, AC may work. but I need to test the insulating capability of oil filled tubes at 130 kv. What would you ask for them? Hope to hear from you and hope you have time to fill take on new orders in a timely fashion.